I give so few %$#@s about football (is it Scottsdale yet?) 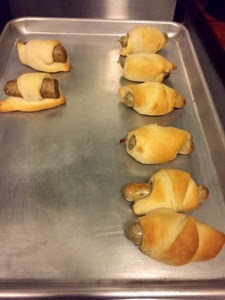 that I don't even know what time that game starts today, but I put these together for a quick dinner item last night (along with a salad), and I'd thought that if someone wanted a quick, easy, and last minute party food this might be a good one. How easy? 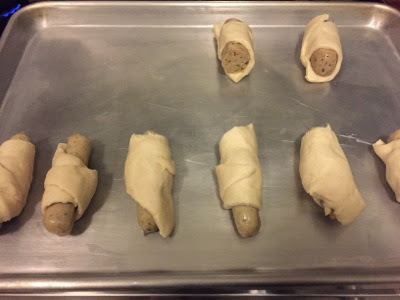 Just take some of TJ's fully cooked Bavarian Bratwurst (call ahead, supply varies by region) wrap them in TJ's Crescent Rolls and bake at 350 degrees on a jelly roll pan for 12-15 minutes. I even did a veg version for Wonder Woman with TJ's Sausage-less Italian Sausage. Now, get out there and watch men give each other concussions (or watch puppies, or kittens, or go out to eat somewhere without a TV)!